Successfully Added Unlocked Quad Band Mobile Phone with Dual SIM with Bluetooth to your Shopping Cart. Unlocked Quad Band Mobile Phone with Dual SIM with Bluetooth. 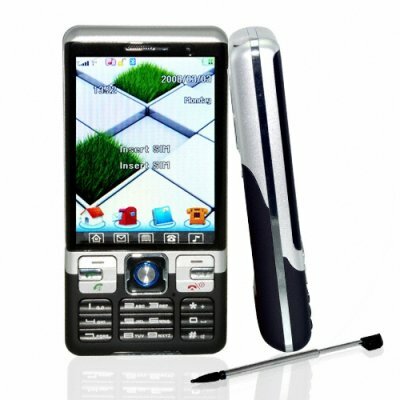 This unlocked GSM/GPRS touch screen cellphone is designed to keep you connected wherever you are in the world. One phone with two numbers everywhere you go: what more could you want? This phone also provides you with tons of high-tech entertainment features that will never leave you bored. When you're not calling, take pictures and videos of you and your friends. Play MP3s and videos, and even enjoy analog TV and FM radio anywhere you go! Moreover, this phone was designed with your convenience and comfort in mind. A 3 inch LCD screen with rich colors lets you read messages with just a glance. One click lets you watch TV or switch between SIM1 and SIM2. The highly responsive on-screen icons and ergonomic keypad make navigation easy. And Bluetooth lets you enjoy the convenience of handsfree calling. With practicality and high-tech functionality packaged into a stylish design, this phone is guaranteed to sell quickly. Get yours today, then take advantage of Chinavasion's factory-direct prices and bulk quantity discounts to stock up today! Your customers will thank you! Brought to you by your best choice for high quality, low price electronics, Chinavasion. NOTE: This product is compatible with GSM at the four frequencies of 850MHz, 900MHz, 1800MHz, 1900MHz. This mobile phone can be used throughout the world. Does this quad band dual SIM unlocked cell phone come with a digital TV tuner as well? No, the cell phone only comes with an analog TV tuner. Does the analog TV tuner work in the USA? Yes, you will be able to recieve analog TV channels where ever you are, whether in North America or anywhere else in the world that broadcasts TV on an analog signal. This phone has all the languages listed in the description above. Thank you for a product, quality, delivery, very pleased, so to hold!!!!!! Thank you to All Your command! on 2009-05-14 05:38:50 Great phone & Great buy !!! That phone is very nice, great option all my friends like the phone they give me money to buy the phone for them and thank you chinavasion for the great phone you sent me very fast shipping nice doing business with you!!! This quad mobile was so beautiful that I highly recommended to all my colleagues whom two of them asked me to order some for them. 5 more need to order them when they see those ordered recently. It is very a very classic phone and my husband who got the first one I ordered need two more for his parents. So better give a good deal because I looking to order more than 6 as soon I get the last recent order. Thank to Jenny who give me all the trust through her communication. She should be promoted for the good work she is bringing to the chinavasion team. I have this phone and every body who sees it wants to have it. It is easy to navigate and has all the functions you ever need in a phone. If external volume control button is added to this phone, it could make volume adjustment when making calls easier. Also the TV reception needs improvement. The phone is light and handy, with excellent audio/video quality, big storage capacity and long lasting battery.